Bowmar was a small company specialising in high technology components for the space programmes and produced a hand-held calculator as a demonstration device for its Light Emitting Diode (LED) displays - "funny red numbers that are almost illegible". So good was the reception to the Bowmar 901B calculator, fondly called the Bowmar Brain, that in September 1971 it moved into large scale calculator production. This model (the 901B) was also produced for other companies including Craig (model 4501) and Commodore (C110). The Bowmar 901B had 4 functions - add, subtract, multiply and divide - and that was all it does. The can only display up to 8 digits. It sold for about USD $200. 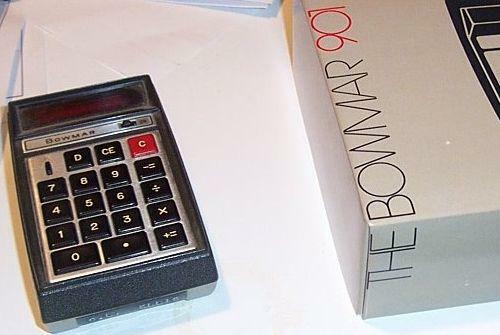 By 1974, Bowmar was the largest manufacturer of hand-held calculators in the world. Bowmar’s total sales increased from $3m in 1971 to $64m in 1973. In 1971, I worked for a business machine company, repairing calculators. I was given a 901B to open up and determine repair ability. There, etched into the corner of the display circuit board, was the logo of a certain famous magazine bunny! Good to know that tech designers those day were able to leave signatures behind in their work. I have a 901C which is not listed on this page or anywhere else. Any info about this? I have the case and instruction manual, all in excellent condition. Anyone interested in buying it. Made in Canada, serial # 40686. I do not have the charging wire. Still looking to purchase a Bowmar 901b Calculator with a low serial number, preferred below 16,000. Does anyone have a low serial number (i.e. below 10,000) that they would like to sell? Original packaging, with all accessories preferred. While I do not have a Model 901, if you are a Bowmar collector, you may be interested in what I believe to be an exceedingly rare Bowmar model. Rare, because I have never found this model listed or described, or any photos of it in any of the web calculator museums - or anywhere else for that matter. It is a slim, brushed aluminum cased, 25 key scientific calc. with blue/green fluorescent display. Bowmar actually labeled it "The Brain", not to be confused with mod. MX120 which is called the "Super Brain", nor is it Bowmar&apos;s other scientific model the "Count". It was made in Taiwan, probably in 1976. If you are curious, I can provide pictures. I WILL LOOK.MY DAD LEFT ME ONE,AND BEING THAT HE WAS THE COMPANY THAT PAINTED THEM FOR BOMAR IT IS AN EARLY ONE. I bought mine as soon as it was available in the Bay Area. It replaced my K&E and wouldn&apos;t snag out of a shirt pocket. Often useless because of my colorblindness, if I was in bright conditions. My first PC was an AppleLisa. I bought the Model 901 in 1972 to help me do my electrical engineering work. It was a welcome addition to my K&E slide rule. I worked in Aerospace & Defense and was able to help develop over 30 Defense related systems during 45 years in engineering.